I am very allergic to poison ivy. At times, it seems all I have to do is look at it. It grows around the trees in my yard. I’ve been working on removing it with a ivy killer spray. So far, it seems to be working. I came down with a rash from poison ivy over the weekend. I have blisters on my arm and face. It itches like crazy. I’ve tried various ointments designed for an ivy rash, but nothing really works. Soaking in an oatmeal bath brings the most relief, along with the numbing affect of ice. The rash lasts for about two weeks, and the itching lasts even when the rash is gone. I really have no idea how I came in contact with poison ivy this time. I saw it over my aunt’s house when swimming in her backyard, but I didn’t go near it. Obviously, somehow I came in contact with the oil. Thanks for the extra information on this annoying condition. I wish I was among the immune. Try the vinegar trick, you may be pleasantly surprised. Excellent advise and love the vinegar and salt advice! Along our neighbors fence is poison ivy that keep wondering over to my side . I pull it best I can but as long as I cant get it all it keeps coming back and I dont want the grandkids to get in it. Thanks so much for the new idea with the vinegar and salt – I am going to try that for sure. Thank you for this info. i live near a ton of poison oak and its the same type of thing. I am allergic to poison ivy & have to watch for it. I always watch for poison ivy. Thanks for the tips. 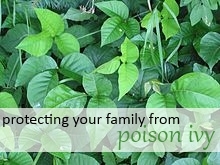 Nothing will ruin a fun Summer day like poison ivy. Thanks for the tips!